Pretty in white, the bride will walk down the aisle in a white gown carrying a pure, white flower bouquet to match! This photo showcases the bridal bouquet, which is similar to the bridesmaids’ bouquets with their arrangements of white roses. Unlike the other bouquets, this arrangement does not have the same dark green leaves as the others. Around the stems of the flowers, a thick white ribbon with jeweled details holds the bouquet together. The bridal bouquet is the perfect place to add a family heirloom or another object of significant importance. These roses are perfectly crisp and white with the gardens in Cabo San Lucas in full bloom. Not only are the options for bouquets amazing, but the natural flowerbeds in Baja California are also incredible year-round! 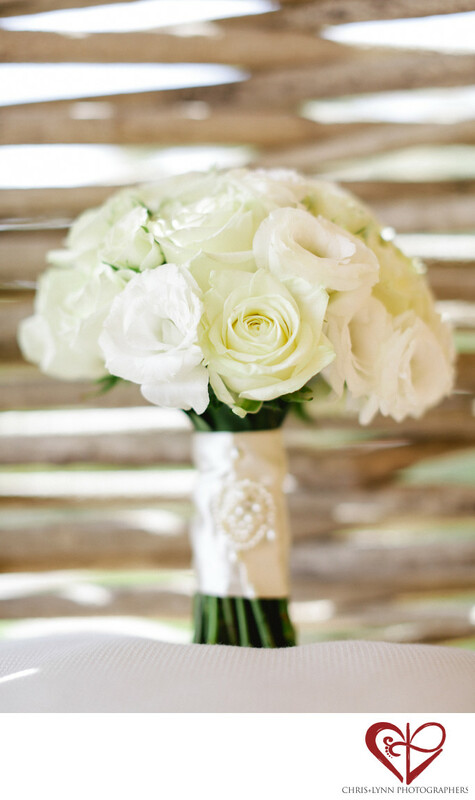 We love the bright shades of white of the bouquet, which will jump out in the photographs!